Black Cohosh Extract is indicated for the relief of the many discomforts associated with menopause. Menopause, as a naturally occurring part of women’s lives, can cause several discomforts, all of which Black Cohosh Extract claims to help with: Hot Flashes, Fatigue, Cramping, Insomnia and Moodiness. Black Cohosh Extract- Black Cohosh Extract has been shown in studies to help relieve the symptoms of Menopause in women. The dosage recommendation for Black Cohosh Extract is one tablet each day with a full glass of water and food. The price for one bottle of Black Cohosh Extract is $10.99 normally. Now, they are selling it for $5.49. This means that you save $5.50. Each bottle of Black Cohosh Extract contains 60 tablets. The Black Cohosh Extract guarantee is nothing. The only thing they say is you must get approval from the Customer Care department, this means that you have to fight them over whether or not you deserve a refund. Then, if you do get a refund, the refund does not include shipping charges, or return shipping. Black Cohosh Extract, as an ingredient, is quite beneficial on its own. However, with this particular product, there is no guarantee of any kind, other than that you are safe while using their site. All returns are on an appeal like process. 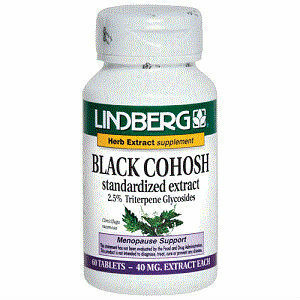 Jackie Horowitz	reviewed Lindberg Black Cohosh Extract	on July 3rd	 and gave it a rating of 2.